Building stairs can help you improve and beautify your landscape and the interior design of your house. Stairs can add decorative flare and value to an inside setting. If you have an old flight of stairs that need to be replaced then knowing how to construct stairs may come in handy. Building stairs is not an incredibly difficult project. However, you will have to know how to remove old stairs if you are not building from scratch. 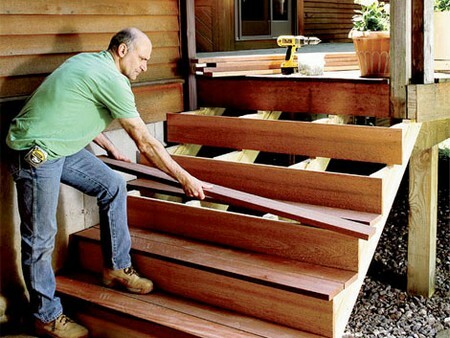 Building your own stairs can also save you money. If done correctly you can have new stairs at a fraction of the cost it would take a professional to complete the task. Here is how you can build stairs. Continue reading on to find out how. Contact the appropriate local government agency to inquire about obtaining a building permit. You need to make sure you will be in compliance will all building codes and ordinances in your respective area. Draw a cross section sketch of your new staircase. You will need to use the old stairs as a subject if you are replacing part of an old stair case. Properly document distance (vertically) from the first and the last step.Also note the distance of every floor level. Measure how deep the tread is. The tread is the section that is walked on. Double check your measurement to ensure accuracy. Put a cardboard rectangle against one side of the stringer. On the center stair tread, leave a 14 inch edge. Move it back so the 10 inch edge touches the stair tread nosing located over it. Use a straightedge for this part. Put it against the piece of cardboard on the stair tread nosings. Draw the lines underneath of the straightedge. You should get the shape of triangle with sloping legs that connect one stair tread nosing to the stair tread nosing underneath it. Demolish the stairs that you are replacing. Save all the stringers and side beams from the set. Trimming these pieces accurately is the most difficult aspect of this project. You should use a template. Use the old stringers to mark the lines you will need on the new lumber. Now put the new stingers in to position. Tack it to make it stay upright. Use the cardboard template to indicate where each tread will be on the stringers. You can use the stair setting of your choice to attach the treads. Brackets will work fine.Finish as desired.